Interdisciplinary is a word that has been picked up by institutions of higher education, research foundations, and even popular culture as a way to articulate the need to move beyond the traditional disciplinary boundaries within which we categorize knowledge about the world. While disciplinary silos in higher education often reflect structures within which teaching and learning are engaged, we contend that critical pedagogy provides an opportunity for innovative thinking and creativity to emerge via Giroux’s (1981) critical notion of praxis. We discuss how Penny’s (2009) notion of deep interdisciplinarity can serve to guide course development in a way that enables any interdisciplinary course to achieve its inevitably unique goals. 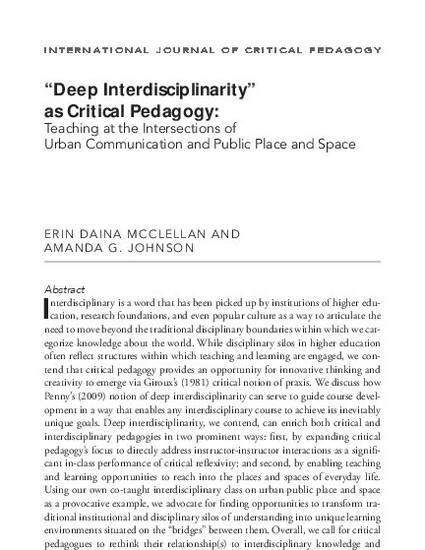 Deep interdisciplinarity, we contend, can enrich both critical and interdisciplinary pedagogies in two prominent ways: first, by expanding critical pedagogy’s focus to directly address instructor-instructor interactions as a significant in-class performance of critical reflexivity; and second, by enabling teaching and learning opportunities to reach into the places and spaces of everyday life. Using our own co-taught interdisciplinary class on urban public place and space as a provocative example, we advocate for finding opportunities to transform traditional institutional and disciplinary silos of understanding into unique learning environments situated on the “bridges” between them. Overall, we call for critical pedagogues to rethink their relationship(s) to interdisciplinary knowledge and for instructors in interdisciplinary classrooms to rethink their relationship(s) to critical pedagogy. This document was originally published by the International Journal of Critical Pedagogy in the International Journal of Critical Pedagogy. Copyright restrictions may apply.